Winglets. 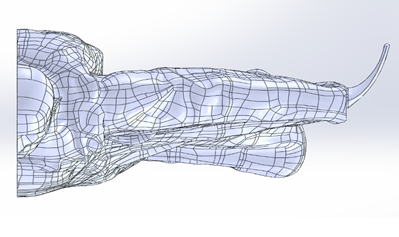 Not something commonly found on wingsuits but our team of CFD analysts have been looking into them. These little devices are used as a drag reduction device on many aircraft and are found at the end of a wing. There are many problems with attaching winglets to a wingsuit such as there being no defined wing tip, not to mention the safety concerns with adding extra material around the pilots hands, but this hasn’t stopped us seeing if it could be a world first. Wingsuit lift is mainly due to the vortices that are generated from the front of the suit and we want to capture and control these to maximise our wingsuits performance. We have created a fully parametrised model that allows us to change Aspect Ratio, Tip Chord, Twist Angle, Sweep Angle and Blend Angle. There are theoretical values for all of these but none of these theories have ever been applied to wingsuits and therefore we are using an iterative process of CFD to improve these piece by piece. The first batch of results are back and they are looking promising. Next step, integrate to baseline and even more tweaking!